Corex Honeycomb is a UK based company producing high-quality aluminium honeycomb core, a fundamental component of some of the most impressive structures in the world. Combining incredible strength with light-weight makes our aluminium honeycomb suitable for a wide variety of applications, including key projects in the automotive, rail, construction, marine, wind turbine, wind tunnel, and architectural industries. Corex Honeycomb has been used in the London Eye, Wind Turbines, the Heathrow Personal Rapid Transit Pod and the Hitachi Class 800 train and The Berkeley Hotel in London. Corex is sponsoring the Formula Student Team from Oxford Brookes Racing for the second year running, supplying them with aluminium honeycomb for the chassis of their racing car. Dr Mike Ashmead, Managing Director and founder of Encocam Ltd. had the vision to manufacture his own aluminium honeycomb to extend the company’s control over its value chain. Since 90% of Encocam’s products require aluminium honeycomb it was essential that the company had its own reliable source of supply. 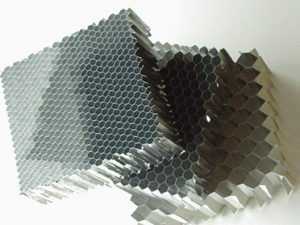 Consequently, Encocam set up Corex Honeycomb as its own manufacturer of aluminium honeycomb which has now become a leading supplier all over the world. Our mission is to become the first choice aluminium honeycomb supplier globally, known for reliability and short lead times. We work with our customers on their projects with input from our Engineering and Product Development team. Our expertise and experience have allowed us to be flexible and adaptable to meet our customer’s requirements. We pride ourselves in seeking solutions collaboratively with our customers, working in conjunction with a wide scope of businesses in the UK and globally. 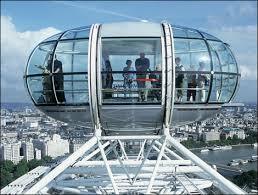 Projects that Corex Honeycomb have collaborated on include The London Eye (pictured above), Heathrow Personal Rapid Transit Pods and the Hitachi Class 800 train. In these structures, our aluminium honeycomb is used in a lightweight, high-strength composite panel as flooring, walls, ceilings and door panels. 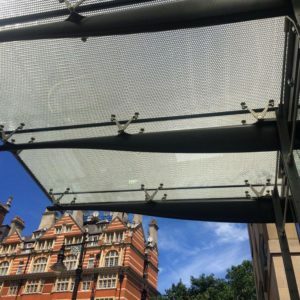 We have also worked with Bellapart, Spain to create a spectacular canopy for the entrance of The Berkeley Hotel in Knightsbridge, London. Rogers, Stirk Harbour were the architects commissioned to carry out the project to create a modern, eye-catching new entrance to the luxury hotel. The revolutionary facade features our aluminium honeycomb sandwiched between glass to create a canopy above the entrance of the hotel.